Congress is under pressure to reduce drug prices, but the obstacles are legion. Current federal regulations protect drug makers from competition and restrict the government’s ability to negotiate bulk prices for large purchases from manufacturers. The nation’s drug distribution system is complex, opaque, short on data, and little understood by consumers. And the huge money at stake gives drug industry heavyweights every incentive to invest billions into blocking change. More competition for the name brand drug makers from generic drug manufacturers would help. 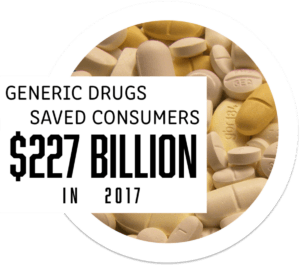 Generic drugs saved American consumers $227 billion in 2017 alone, by one estimate, but both federal policies and drug industry abuses in the past 20 years have blocked their development. In the U.S., laws meant to promote innovation have given drug makers an unusually long window of market exclusivity that protects their monopolies. The makers of new biologic drugs, for example—medicines made from living cells—enjoy exclusive market rights for a full dozen years. That’s seven years longer than the exclusivity granted conventional, small-molecule drugs. A scuttled Obama administration plan to restrict biologics patents and bring them in line with small-molecule drugs would have saved the government just under $7 billion over a decade, according to the Office and Management and Budget. Henry Waxman, the former congressman whose 1983 legislation gave birth to the generic drug industry, says the patent system must be tightened. He suggests new policies to require patent applicants to demonstrate significant differences, originality, or additional benefit to qualify for secondary patents. It is those secondary patents that grant the original drug developer additional years of competition free pricing. 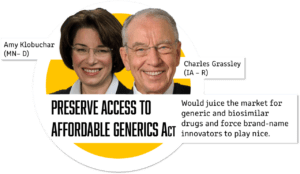 To juice the market for generic and biosimilar drugs and force the brand-name innovators to play nice, Senators Amy Klobuchar, the Minnesota Democrat, and Charles Grassley, an Iowa Republican have proposed a bill that would crack down on what’s known as “pay-for-delay” agreements. Such deals enable brand manufacturers to settle patent infringement lawsuits with potential generic competitors by stipulating that the new, more affordable replacement drug won’t be released until a certain date down the road. That gives the original manufacturers more years of exclusivity and keeps drug prices high. A bipartisan bill authored by Vermont Democrat Patrick Leahy would make it harder for generic and biosimilar drug makers to block their competitors from testing and developing cheaper alternatives. Manufacturers do this by refusing to let competitors buy samples of their medicines, even once the patents have expired. Some have also refused to participate with generic drug makers in safety protocols required by the FDA, citing a danger to consumers but effectively choking off their generic rivals. Leahy’s CREATES Act, which is backed by a long list of health industry stakeholders, would allow generic drug manufacturers to go to court to obtain the samples they need. It would also let the FDA approve alternative safety protocols, so generic drug makers wouldn’t be forced to win the cooperation of brand drug innovators. A popular idea on both sides of the aisle is to allow Americans to buy cheaper drugs from Canada. Bills to permit such imports have been introduced by Klobuchar and her fellow Minnesota Democrat Al Franken, and by Arizona Republican John McCain, among others. Democratic Senator Ron Wyden, of Oregon, is leading the charge to pull back the curtain on Pharmacy Benefit Managers. PBMs are the companies that run the prescription benefit programs for major health insurers. These middlemen essentially operate in total secrecy, making it impossible to know how much of the money they save in negotiations with drug makers is actually passed on to consumers. Wyden’s bill to require PBMS to disclose their “rebate” and “discount” data is now before the Senate Finance Committee. You can find out more about PBMs here. Federal constraints on the government’s negotiating power go to the heart of high drug prices, say Democrats pushing to require the Health and Human Services Department to negotiate Medicare Part D drug prices on behalf of beneficiaries. It’s a concept that on the other side,President Trump endorsed earlier this year. Klobuchar and Vermont Senator Bernie Sanders are among those who have authored bills that would move HHS in this direction. To many Democrats, the most direct way to slash drug prices is to put the government in charge of health care. A third of Senate Democrats have rallied behind the single payer “Medicare for All” bill that Sanders introduced in September. The bill would dramatically reduce drug costs by letting Medicare negotiate prices with drug companies, say its fans. Critics say the bill would curtail consumer options and limit funding for drug innovation, and with Republicans in charge, it is dead on arrival. But in Canada and the United Kingdom, government-run health care systems have helped curb per-capita health care costs to roughly half what they are in the U.S., and more than half of all Americans now endorse the concept of single payer. Outside Washington, 43 states introduced legislation aimed at lowering drug prices this year. California has led the way, with a far-reaching package that includes regulations on conflicts of interest between Prescription Benefit Managers and drug makers. More than two dozen states have introduced bills that would require drug companies to disclose their research and development costs, an idea some patient advocates want to see implemented at the federal level. At least a dozen states have proposed authorizing pharmacists to prescribe lower-cost generic or biologic drugs to patients. To many industry experts and stakeholders, the answer lies not in government but in a private sector solution known as value-based pricing. The idea is to tie drug prices directly to health care outcomes. A first-of-its-kind consortium of patient advocates, manufacturers, providers and health care experts formed earlier this year to promote value-based drug payment arrangements, housed at Duke University’s Robert J. Margolis, MD, Center for Health Policy. A pioneer in this arena was Merck, which in the early 1990s guaranteed patients that its cholesterol-reducing drugs would help them hit specific markers, or they would get their money back. Value-based agreements can take other forms, too. 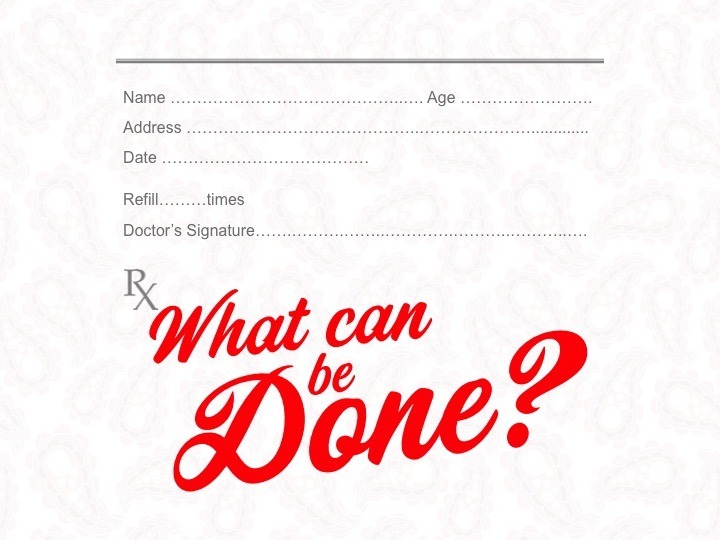 For example, a manufacturer might sell an insurer not only a medication, but a guarantee that patients will take the medication as prescribed, essentially coupling the drug with a compliance program. The benefit to value-based pricing, say its advocates at the Margolis Center and elsewhere is that has the potential to align a drug’s price with its actual value, boost consumer confidence, encourage risk sharing, and enable private sector players to manage drug prices more effectively. The idea has won the endorsement of House Speaker Paul Ryan, and is backed by think tanks on both the right and the left. The down side, say skeptics, is that such agreements are complex, involve collecting and managing vast amounts of patient data, which can raise privacy issues, and come with high administrative overhead.